Links to this page can be found in Book 10 and Day 6. Villa Doria, with its noble site, its splendid views, its great groups of stone pines, so clustered and yet so individual, its lawns and flowers and fountains, its altogether princely disposition, is a place where one may pace, well mounted, of a brilliant day, with an agreeable sense of its being rather a more elegant pastime to balance in one's stirrups than to trudge on even the smoothest gravel. 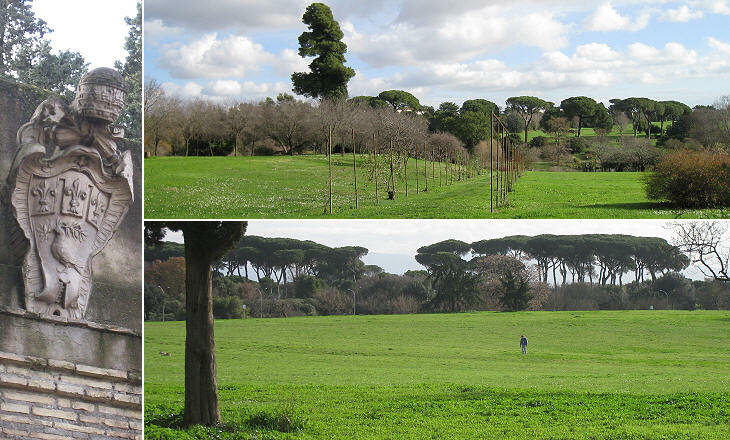 Villa Pamphilj was divided into several sections which were separated by railings and walls. The southern part of the villa was used for hunting and riding while the eastern one was used for farming. The gates allowing communication between the various sections were designed with care. The Pamphilj had so many properties that they had a permanent position for an architect. 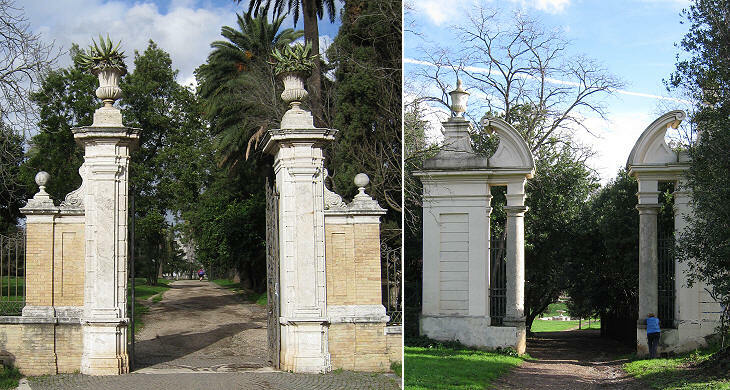 Gabriele Valvassori was the architect of the Pamphilj between 1720 and 1739 and he designed several gates and small fountains in the area near Villa Vecchia. 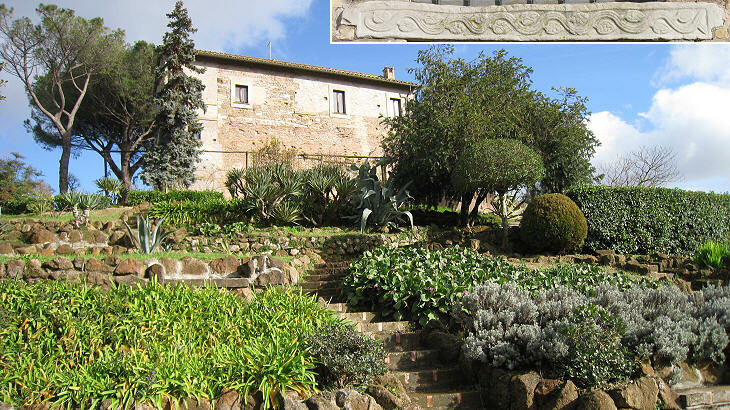 One of these is unusual for the use of tufo for a large statue of a river; the material is dark and does not allow for fine sculpting, so the choice of Valvassori is somewhat puzzling. He redesigned also the family palace on Via del Corso. In the last decades of the XVIIIth century Prince Marcantonio IV Borghese renovated his villa and this prompted the Doria Pamphilj to do the same (in 1760 the last of the Pamphilj passed away and the property was inherited by the heirs of Anna Pamphilj who had married Giovanni Andrea III Doria, of a noble Genoese family). At that time the family architect was Francesco Bettini who relocated a heraldic fountain designed by Algardi at the top of a hill. Bettini designed a long waterfall which ended in a small pond: it was decorated with other fountains and it had hidden underground passages. Today we regard playing hide-and seek as a game for children; in the XVIIIth century it was a popular pastime for wealthy adults and these secret passages added to the fun. 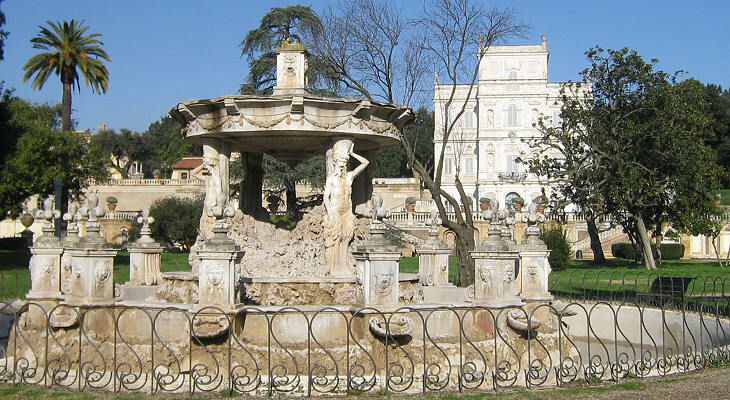 On April 30, 1849 Villa Doria Pamphilj became the scene of fighting between the French troops who were trying to restore papal authority in Rome and Garibaldi and his volunteers who fought for the Roman Republic. At the end of the day the villa was controlled by Garibaldi and his men. At the beginning of June however the defenders had to retrench behind Porta S. Pancrazio; the ensuing artillery fire lasted for a month and it led to the destruction of Villa Corsini, Villa del Vascello, Casino Farnese and Villa Spada. 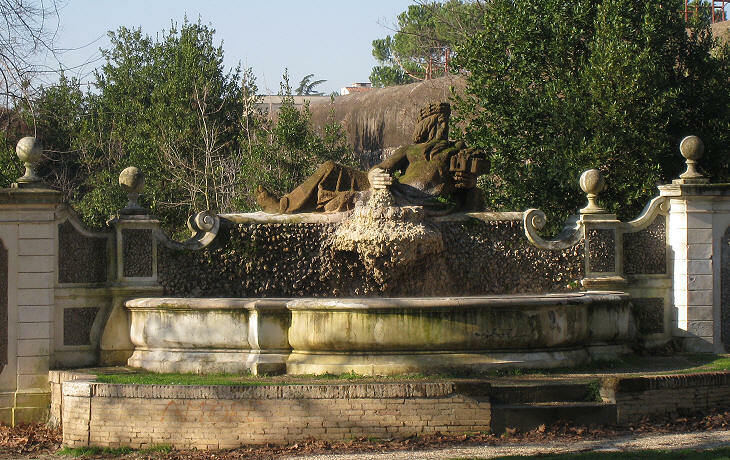 Villa Doria Pamphilj was not directly hit by artillery, but the movement of troops and equipment damaged the XVIIth century setup of the gardens. In the 1850s the Doria Pamphilj bought Villa Corsini and built there a sort of triumphal arch which provided their estate with a grand entrance. You may wish to learn more about the 1849 events by reading excerpts from George Macaulay Trevelyan's "Garibaldi's Defence of the Roman Republic". After the end of the war Andrea Busiri Vici designed a new fountain which made use of elements of earlier fountains or decorations; its rigid geometrical design makes it similar to a wedding cake. The Doria Pamphilj were keen supporters of the papal cause and in 1851 they commissioned Andrea Busiri Vici a memorial to the French soldiers who fell for the conquest of Rome. 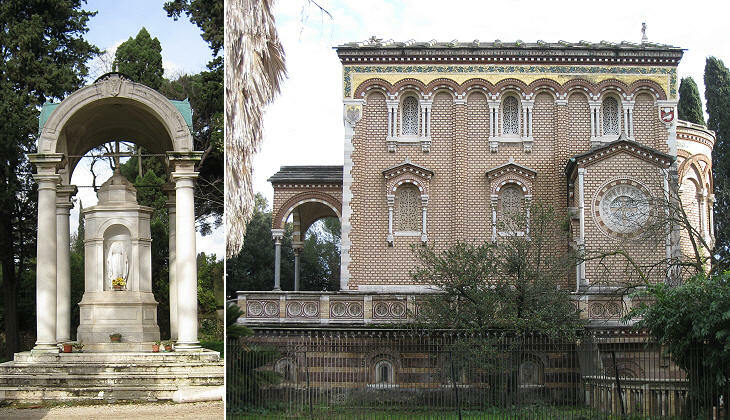 The last major addition to the villa was a very incongruous family chapel; its style is vaguely Byzantine. 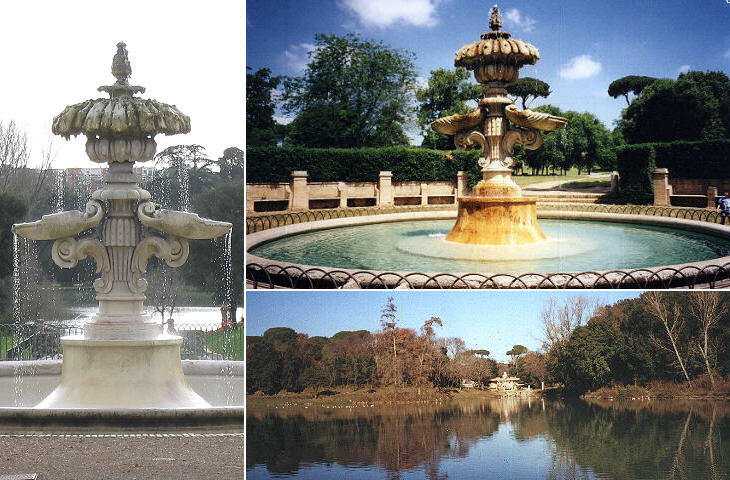 During the XIXth century the Doria Pamphilj bought some farms which stood to the west of the villa; also this section is today a public park; it does not have elaborate fountains or ancient statues, but it grants that Bel Respiro (deep breath) which was the name of the villa in the XVIIIth century. 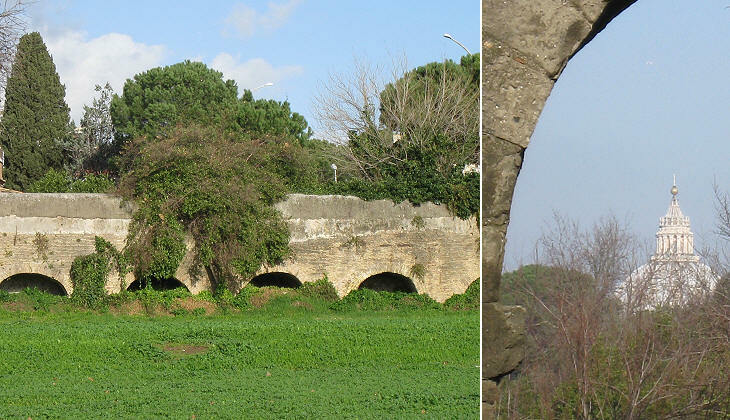 The northern wall of the park is in part made up of arches of Aqua Traiana, an ancient Roman aqueduct which Pope Paul V restored to carry water to Trastevere and Borgo. 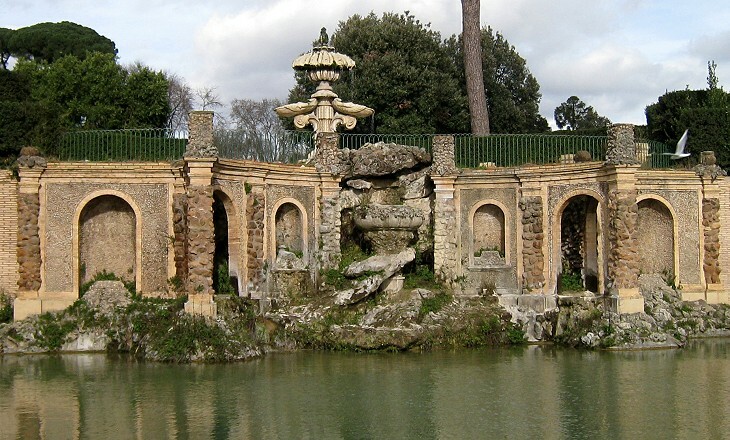 It supplied also Villa Pamphilj with the water needed by its many fountains. 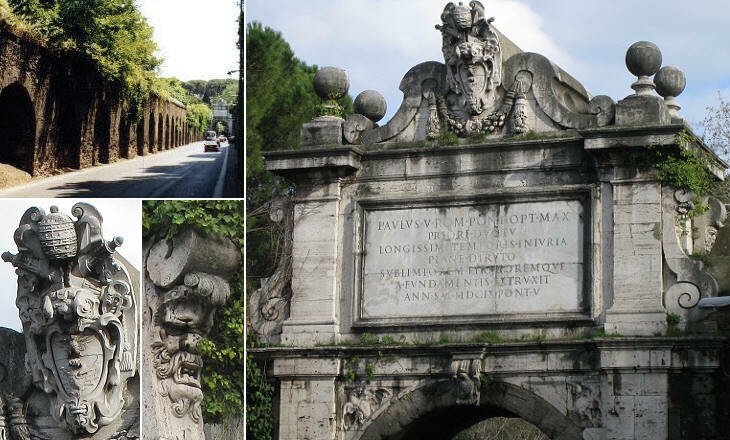 The aqueduct ended with Mostra dell'Acqua Paola, a large fountain having the aspect of a triumphal arch, but its completion was celebrated also by an actual triumphal arch across Via Aurelia. We are told by Pietro Sante Bartoli that when he first came to Rome, towards 1660, Olimpia Maidalchini and Camillo Pamfili, who were then laying the foundations of the casino, discovered "several tombs decorated with paintings, stucco-carvings, and nobilissimi mosaics." (..) He says that the thirty-four tombs formed, as it were, a small village, with streets, sidewalks, and squares; that they were built of red and yellow brick, exquisitely carved, like those of the Via Latina (and of Porto). (..) The only one still visible was discovered in 1838, and is remarkable for its painted inscriptions, and for its frescoes. There were originally one hundred and seventy-five panels, but scarcely half that number are now to be seen. 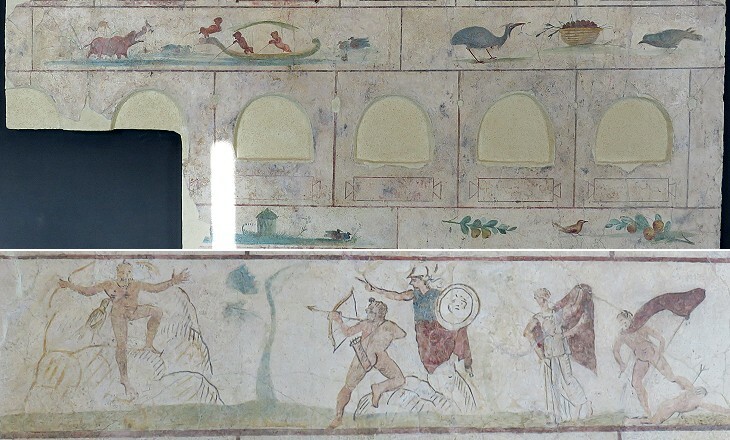 Some of the sarcophagi and other ancient works of art which embellished the villa came from a necropolis in its grounds. In 1838 excavations unearthed a large IInd century AD columbarium, a tomb resembling a dovecot because of its many niches which housed cinerary urns. It was not meant for a family, but most likely, similar to a modern ossuary, its niches could be bought separately. In 1922 the fresco decoration of the columbarium was detached to halt its deterioration and part of it is displayed at Museo Nazionale Romano. 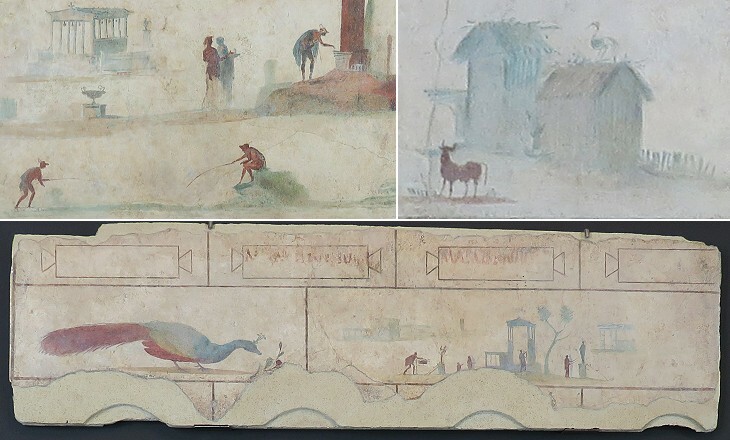 The subjects of the frescoes are varied: landscapes, imaginary buildings, Nilotic scenes (similar to those found at Porto), animals, mythological stories, etc., all without any apparent link to the purpose of the building they decorated. Next step in Day 6 itinerary: Monastero di S. Maria dei Sette Dolori. With these words (have a happy life) to his readers (and to you) Vasi closed his tenth and last book.